On the heels of its last defeat, the nefarious Black Hole Army has fallen under the control of a deadly new commanding officer. He has sent its new COs to attack the nations of Wars World once again, and it�s up to the allied armies of Orange Star, Blue Moon, Yellow Comet and Green Earth to put an end to Black Hole once and for all. Players lead their new Commanding Officers to fend off the Black Hole Army�s latest invasion. 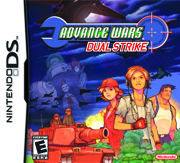 With massive battles that sweep across both screens, Advance Wars: Dual Strike will change the face of Dual-Screen warfare forever.